After a rather mundane performance on the field, a majority of post Super Bowl LIII talk has been dominated by the – dare I say, head-scratching – halftime performance. And wouldn’t you know it, PETA chimed in once again to criticize one of the performer’s outfit choices. 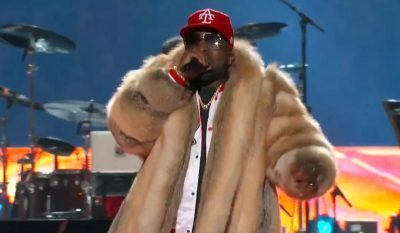 In case you used halftime to showoff the new additions to your trophy room, Maroon 5 headlined, followed by Travis Scott and then Atlanta rapper Big Boi rolled onto the scene donning a large fur coat. PETA didn’t just stop there either..
Big Boi has yet to respond to PETA’s tweets to this point, and we pretty much expect it to stay that way. The post PETA Slams Super Bowl Halftime Performer For Wearing Fur Coat appeared first on OutdoorHub.